I needed a lap top cover. What is it with guys and laptop covers? Hmm, let me see, can I choose between the black lap top cover with black or the lap top cover with more black but a little grey. But then there is the grey lap top cover with a little bit of black and more black. Because I want something individual. 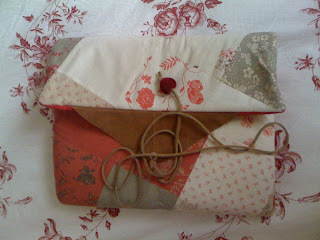 I made the Amy Butler laptop cover, it looked great but it didn't really do the job. the protection for the laptop was only on the front. While making sure your screen was protected, the back of the lap top wasn't so well protected. There are a few tutorials floating around the web, I looked at most of them but then gave up. I looked at my little laptop, my superb little macbook pro and I made a mental list of all the things I need in a lap top cover. I needed protection for my laptop. I carry it in a bag that is not reinforced, so protection is the key factor. It has to look good. And because I just loved Rouenneries by French General, I wanted to use Rouenneries and make it look okay. The old KISS principle. Keep It Simple Stupid. This is what I tried to do, I don't know that I succeeded but I am happy and I have had some comments on it as well. I also wanted to keep the cost down and I used some stuff I had here as well. So here are the directions, please show me pictures of your lap top cover if you make it, I would just love to see it. I then made a flap out of a large scrap of suede that I had, but the flap can made out of fabric but please remember that the following measurements I am going to give you are WITHOUT seam allowance on THREE sides. This is because I don't need to seam suede edges but I do need to make allowance for sewing the flap into top cover edge. You will need a piece of Timtex or similar that is approx : 20" (51 cm) x 14" (35.5 cm). This will give your lap top cover a bit of rigidity and the ever important protection your lap top will love you for. You'll also need 2 pieces of A2 paper (Taped together along 1 short side on each piece of paper) plus a long ruler and a sharp pencil. Aye Curumba this is a long post. Okay, lets kick off with the actual fun stuff, the making of the cover. 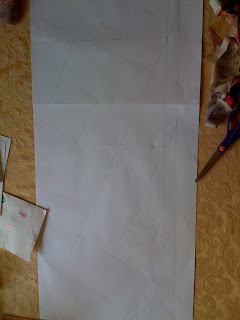 On my big long rectangle piece of paper I measured out a rectangle with my pencil that was 14 1/2" (37 cm) x 39" (99.5 cm). 1/4 " ( .8 cm) , 4 3/4" (12.2 cm) , 5" ( 12.8 cm) , 1 3/4" ( 4.5 cm) , 3 1/8" ( 4.5 cm) , 5" ( 12.8 cm) , 1 1/4" ( 3.2 cm ) , 3 1/4" ( 8.3 cm ) , 5" ( 12.8 cm ) , 1 1/2" ( 3.9 cm ) , 3 1/2" ( 8.9 cm ) , 4" ( 10 cm ). 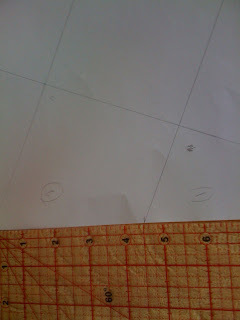 I know this all seems very painful and it is a little bit but its over now and the easy part of your grid begins now. What I did was at the very first point I marked on the side closest to me, I ruled a line from that mark to the second mark from the beginning marks on the other side. I hope that makes sense, please look at the pictures, they should help. 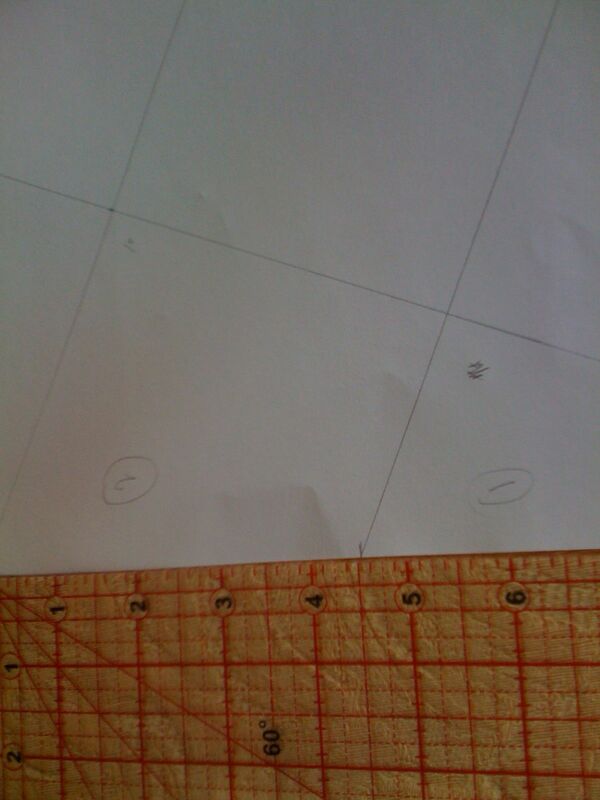 Basically, you will have drawn a connecting line that is on an angle, like in the picture above.